Beginning with the Potala Palace in Lhasa, which lies at an altitude of 3,700 meters / 12,000 feet. Construction began in 1645. 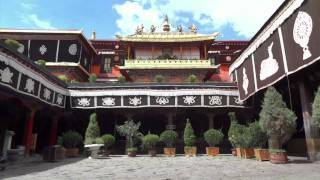 The second video shows Jokhang Temple, said to be the most sacred; it dates from the 7th century. Followed by (last two films) an historical background. The Potala Palace was named after Mount Potala, the abode of Chenresig or Avalokitesvara. The Potala Palace has in the past served as the chief residence of the Dalai Lama. Today, the Potala Palace is a museum. Lozang Gyatso, the 'Great Fifth Dalai Lama', started construction of the Potala Palace in 1645 after one of his spiritual advisers, Konchog Chophel (d. 1646), pointed out that the site was ideal, being situated as it is between Drepung and Sera monasteries and the old city of Lhasa. It may overlay the remains of an earlier fortress, called the White or Red Palace, on the site built by Songtsen Gampo in 637. The Sera and Drepung monasteries are two of the 'great three' Gelukpa university monasteries of Tibet. Sera Monastery is located in the foot hills 2 kilometers north of Lhasa. The origin of the name 'Sera' is attributed to a fact that the site where the monastery was built was surrounded by wild roses (se ra in the Tibetan language) in bloom. The Sera Monastery, as a complex of structures with the Great Assembly Hall and three colleges, was founded in 1419. The Sera Monastery in Tibet, and its counterpart in Mysore India, are the best locations to witness the "Monk Debates" on the teachings of Buddha and the philosophy of Buddhism. Sera Monastery developed over the centuries as a renowned place of scholarly learning, training hundreds of scholars. Drepung Monastery (literally "Rice Heap" monastery) is located at the foot of Mount Gephel (Gambo Utse), five kilometers from the western suburbs of Lhasa. Drepung is the largest of all Tibetan monasteries.